NASA astronaut Barry "Butch" Wilmore is seen in this photo taken by fellow spacewalker Terry Virts on Feb. 21, 2015. A NASA astronaut snapped a truly out-of-this-world selfie during a spacewalk over the weekend. Barry "Butch" Wilmore, commander of the International Space Station's current Expedition 42, took a photo of himself during a spacewalk on Saturday (Feb. 21) that captured a gloriously blue, cloud-studded ocean in the background. 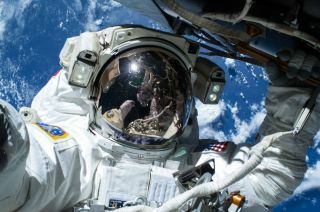 Fellow spacewalking NASA astronaut Terry Virts also appears in the shot, reflected in Wilmore's visor. Wilmore and Virts ventured outside Saturday on the first of three spacewalks in the span of a week. The excursions will help prepare the station for the eventual arrival of private, crew-carrying American spaceships. "The spacewalks are designed to lay cables along the forward end of the U.S. segment to bring power and communication to two International Docking Adapters slated to arrive later this year," NASA officials wrote in a description of Wilmore's spacewalk selfie. "The new docking ports will welcome U.S. commercial spacecraft launching from Florida beginning in 2017, permitting the standard station crew size to grow from six to seven and potentially double the amount of crew time devoted to research," they added. In September, NASA awarded SpaceX a $2.6 billion contract to complete development of its manned Dragon capsule. Boeing got $4.2 billion to finish work on its crewed vehicle, a capsule called the CST-100. NASA hopes at least one of these spaceships is up and running by 2017. The space agency has been dependent on Russian Soyuz spacecraft to ferry its astronauts to and from the orbiting lab since the retirement of the space shuttle fleet in 2011. The other two spacewalks in the current series, which will also be performed by Wilmore and Virts, are scheduled for Wednesday (Feb. 25) and Sunday (March 1) and will start around 7:10 a.m. EST (1210 GMT) on each day. You can watch them live here at Space.com, courtesy of NASA TV, beginning at 6 a.m. EST (1100 GMT).